The American public views today’s immigrants with a mix of admiration and concern. Overall impressions of recent migrants to the U.S. from Latin American and Asian nations are generally positive, and nearly half of the public believes immigrants today are just as willing to assimilate as those of two centuries ago. Still, majorities express the view that new immigrants do not learn English fast enough and pluralities believe that most immigrants today are here illegally. A plurality of Americans (44%) believe today’s immigrants are less willing to adapt to the American way of life compared with those who came here in the early 1900s. However, slightly more (49%) say current immigrants are as willing to adapt (30%) or are more willing to adapt (19%) than immigrants from the early 20th century. Roughly three times as many Hispanics as non-Hispanic whites believe today’s immigrants are more willing to adapt to American customs (40% vs. 13%). Similarly, 31% of recent immigrants credit contemporary immigrants for their adaptability, compared with just 16% of those whose families have not recently emigrated to the U.S. There are small but significant political differences on this question. By a margin of 54% to 40%, Republicans are more apt than Democrats to think immigrants today resist assimilation. In addition, conservatives are more likely to hold this view than are liberals. In the national sample, proximity to immigrants does not appear to affect perceptions about willingness to assimilate. However, respondents in the two metropolitan areas where immigration is most often viewed as a serious local problem – Phoenix and Las Vegas – stand out for their negative impressions of the willingness of today’s immigrants to adapt. Roughly half in these two metropolitan areas (52% in Phoenix, 50% in Las Vegas) say immigrants now are less willing to adapt than those in the early 1900s. One of the continuing sources of conflict over the assimilation of immigrants is language, as seen in recurring battles over English-only policies and statutes. A sizable majority of the survey’s respondents (58%) said they believe that most recent immigrants do not learn English within a reasonable amount of time; slightly more than a third (35%) say that they do. Within the case study communities, the belief that immigrants lag behind in the adoption of English ranged from a high of 66% in Phoenix and Las Vegas to 51% in the Washington metro area. Hispanics are the only major demographic group in which a majority (55%) believes that most recent immigrants learn English in a reasonable period; however, 39% say this is not the case. People who live in areas with substantial concentrations of foreign-born people are more likely than those with few immigrants in their area to say that immigrants learn English within a reasonable amount of time. Roughly four-in-ten (39%) in areas with a high proportion of foreign-born people say this, compared with 27% in areas with few immigrants. An increasing number of Americans say they encounter immigrants who speak little or no English. About three-quarters (74%) say they often (49%) or sometimes (25%) come in contact with immigrants who speak little or no English; that compares with just 51% who said that in 1997. Residents of Phoenix and Las Vegas report extensive contacts with immigrants who speak English poorly, or not at all. About two-thirds in each city (68% in Phoenix, 66% in Las Vegas) say they often encounter this situation; smaller percentages in Raleigh-Durham (59%), Washington DC (56%) and Chicago (50%) say the same. Most people nationwide (61%) who say they have contact with immigrants who speak little or no English say it does not bother them; 38% say they are bothered by this experience. While people in Phoenix and Las Vegas report more contact with immigrants who do not speak English well, majorities in both cities say they are not bothered by this (58% in Phoenix, 56% in Las Vegas). Public impressions of immigrants from Latin American and Asian nations are generally positive and have become significantly more favorable over the past decade or so. Latin American and Asian immigrants have long been viewed as hard-working and as having strong family values, and these impressions are even stronger now. And, negative views have softened substantially. Many fewer people today believe that either Latin American or Asian immigrants end up on welfare, or increase crime. About eight-in-ten Americans believe that Latino and Asian immigrants are hard working and have strong family values. In particular, the view that Latin American immigrants are industrious has grown notably since 1993 – from 65% to 80% today. In contrast, the public is split on how Latin American immigrants do in school: 41% say they do well, while 33% say they do not. 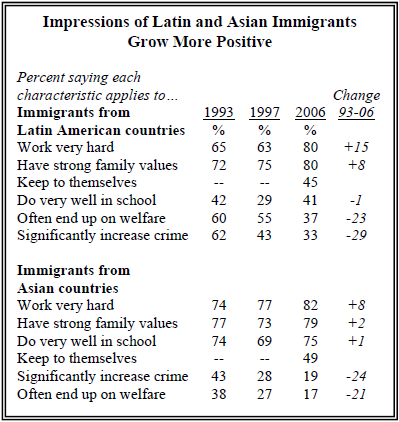 But that represents an improvement compared with 1997, when just 29% felt Latin immigrants did well in school. Negative impressions of both Latin American and Asian immigrants are much less common now than they were a decade ago. In 1993, majorities believed that Latin American immigrants significantly increased crime (62%) and said they “often end up on welfare” (60%). In the current survey, 37% believe they are prone to end up on welfare and 33% say they significantly increase crime. In 1993, fewer people saw Asian immigrants as likely to increase crime or to need welfare (43% and 38%, respectively), but those numbers have also declined dramatically (now just 19% and 17%). However, substantial numbers of people believe Asian and Latin American immigrants are reluctant to assimilate. Pluralities say that the phrase – “keep to themselves and don’t try to fit in” – applies to immigrants from Asian countries (49%) and Latin American countries (45%). Negative opinions about Latin American and Asian immigrants are more prevalent among the less educated, and the financially stressed. For example, the belief that Hispanic immigrants “often end up on welfare” is held by 42% of those with a high school education but just 24% among those with a college degree. The perception that Latin American immigrants increase crime is much more prevalent in Phoenix and Las Vegas than it is nationally, or in the three other cities surveyed. 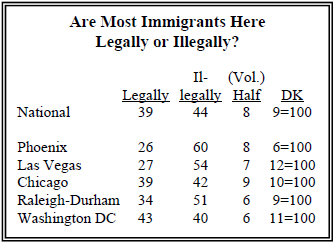 Nearly half in Phoenix (46%) and Las Vegas (45%) believe that Latin American immigrants significantly increase crime; that compares with fewer than four-in-ten in Raleigh-Durham (37%), Washington DC (31%), and Chicago (30%), and 33% nationally. More generally, however, people who live in areas with a high proportion of immigrants are less likely to say Latin American immigrants increase crime and go on welfare than are those living in areas with low concentrations of foreign-born people. Beyond the view of ethic immigrants in particular, public attitudes about a variety of racial and ethnic groups are generally quite positive and have shown no trend over the past ten years or so. Opinions about Asians, Hispanics, blacks, and Jews are predominantly positive, with 75%- 84% of the public saying they have “very” or “mostly” favorable opinions of each group. For each group, more people have a “mostly favorable” than a “very favorable” attitude, but there is no trend within these categories. Negative opinions about Hispanics are more common among older respondents (27% unfavorable among those 65 and older) and people who live in places with few foreign-born residents (27%) unfavorable. With respect to Asians, in no demographic group do as many as 20% have an unfavorable opinion. When asked what proportion of the American public born outside the United States, most people choose a figure that is much higher than the Census Bureau figure of 12 percent. Of four options offered, just 34% select the correct response (“closer to 10 percent”). 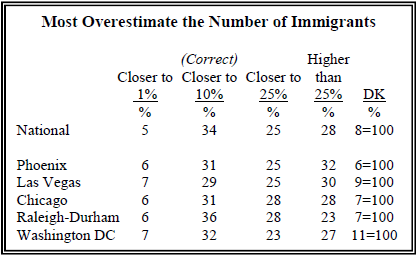 A quarter of the respondents say the number of foreign-born is “closer to 25%,” and nearly three-inten (28%) say it is “higher than 25%.” Just 5% of respondents select the lowest option (“closer to 1 percent”). A growing number of Americans say they have recent immigrants living in their area. Overall, 62% say they have many (35%) or some (27%) recent immigrants in their area, up from just 39% in 1997. In four of the five metropolitan areas surveyed, roughly half of respondents say they have many recent immigrants living in the area. The exception is Chicago, where only about a third (32%) expresses this view. Hispanics are far more likely than whites or African-Americans to report that their area includes many recent immigrants. People living in the West (46%) report many recent newcomers living close to them much more than do those in other regions. In contrast, people in the Midwest are least likely to say many recent immigrants live nearby (22%). Southerners and those in the East reflect the national average (38% and 34%, respectively). The percentage of Americans who say they have friend or relative who is a recent immigrant has also increased dramatically in the past decade, as the overall rate of immigration has risen. Roughly a quarter say that now (26%), up from 19% in 1997. A small but significant minority of the public (16%) say they or a family member has either lost a job or not gotten a job because the employer hired an immigrant instead. And this experience is strongly associated with negative views of immigrants and broad support for decreasing legal immigration. A quarter of those with annual household incomes of less than $20,000 say they or a family member has lost a job to an immigrant. Education also is a factor in these perceptions; 20% of people with a high school education say an immigrant has cost them or a family member a job, compared with 7% of college graduates. Fully 75% of those who report losing a job to an immigrant say they believe immigrants are burden on the U.S., costing jobs, housing and health care. That compares with just 47% of those who say they have not had this experience. Losing a job to an immigrant also affects how people look at immigration policy. Six-in-ten (61%) of those who say they have lost a job to an immigrant believe legal immigration should be decreased, compared with 36% of those who say they have not had this occur.